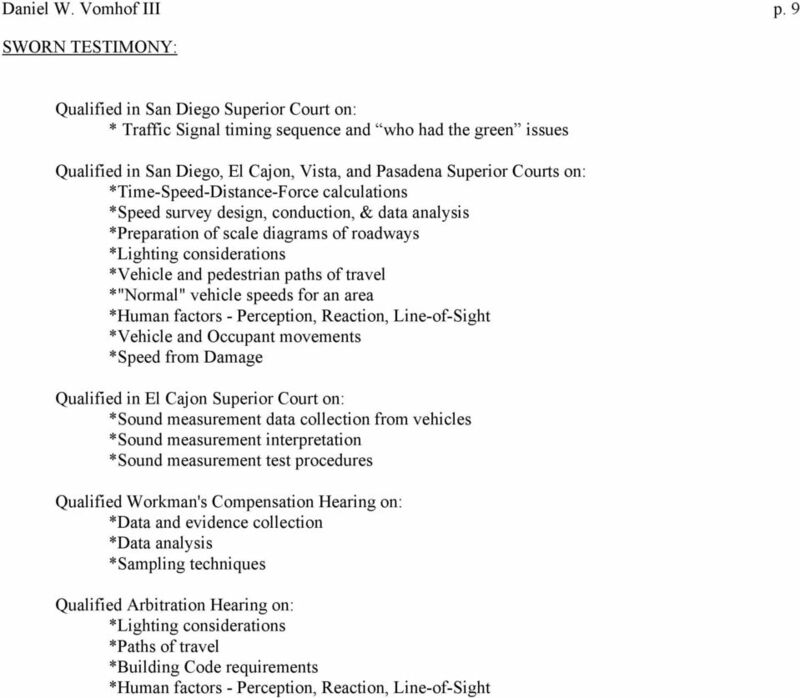 Download "EXPERT WITNESS SERVICES, INC FORENSIC RESEARCH LABORATORIES 8387 UNIVERSITY AVE., LA MESA, CA 91942 (619) 464-3477"
1 EXPERT WITNESS SERVICES, INC FORENSIC RESEARCH LABORATORIES 8387 UNIVERSITY AVE., LA MESA, CA (619) EXPERIENCE: Daniel William Vomhof III, E.I.T. 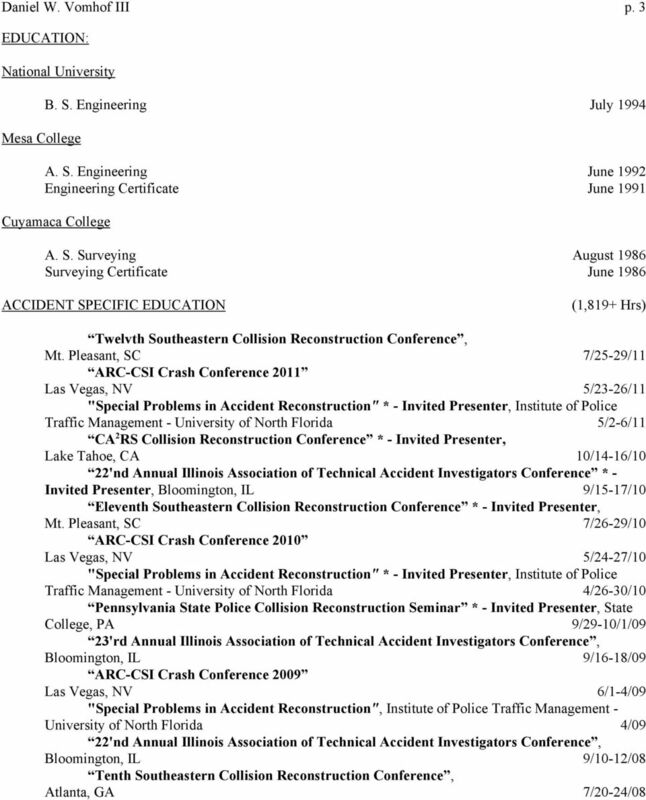 Certified Accident Reconstruction Specialist Expert Witness Services, Inc. (1992-present) - Accident Reconstructionist. 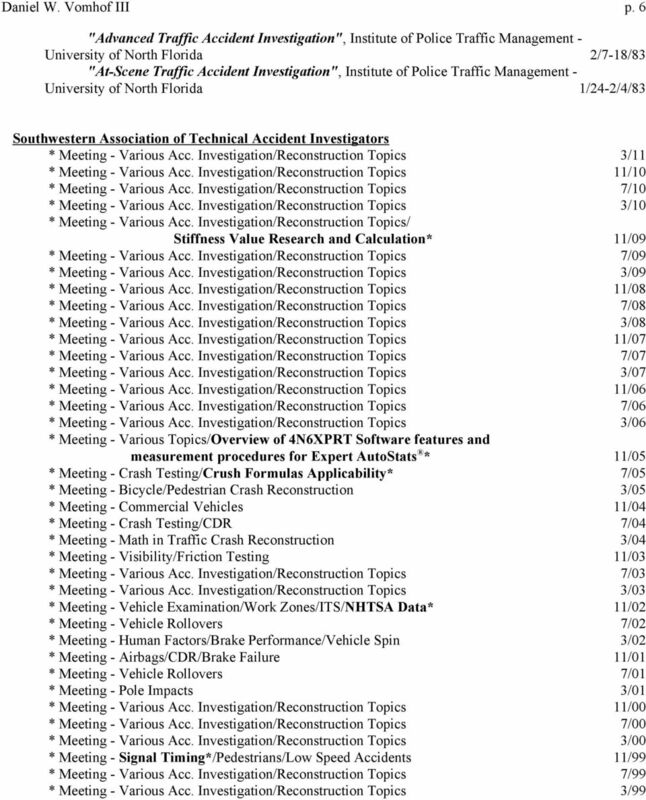 ( ) - Accident Reconstruction Assoc. 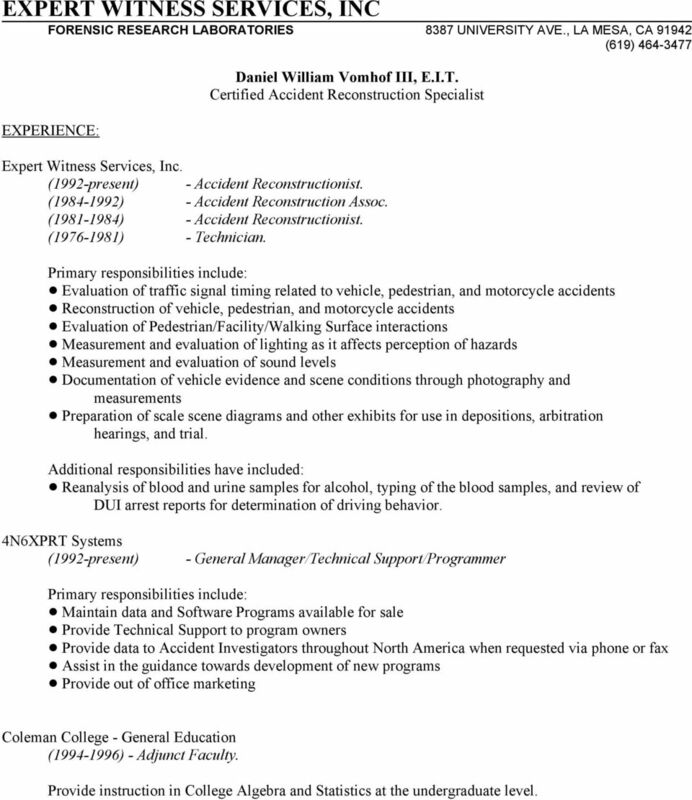 ( ) - Accident Reconstructionist. ( ) - Technician. Primary responsibilities include:! 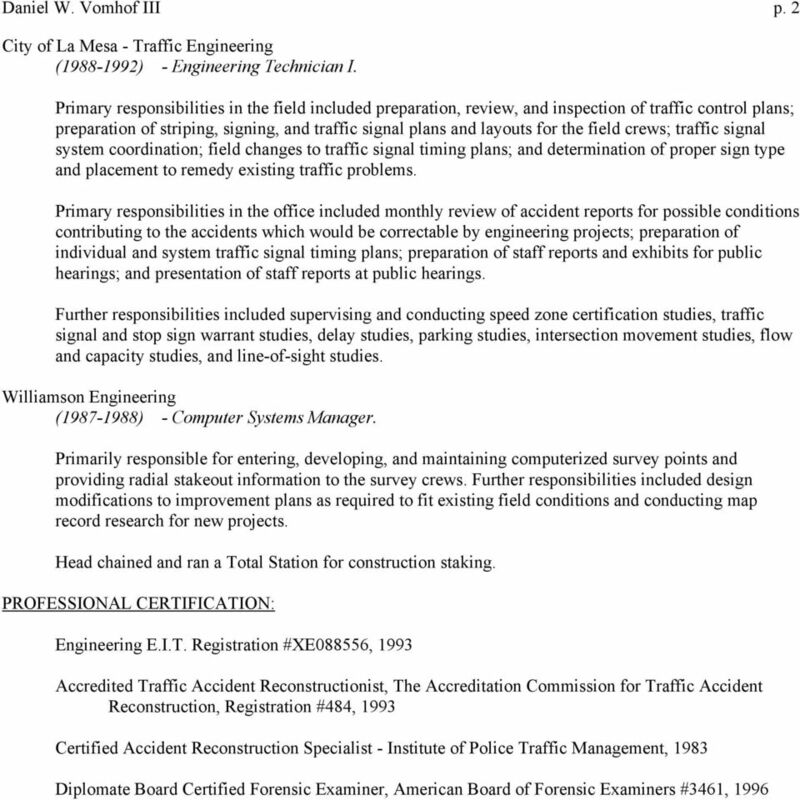 Evaluation of traffic signal timing related to vehicle, pedestrian, and motorcycle accidents! 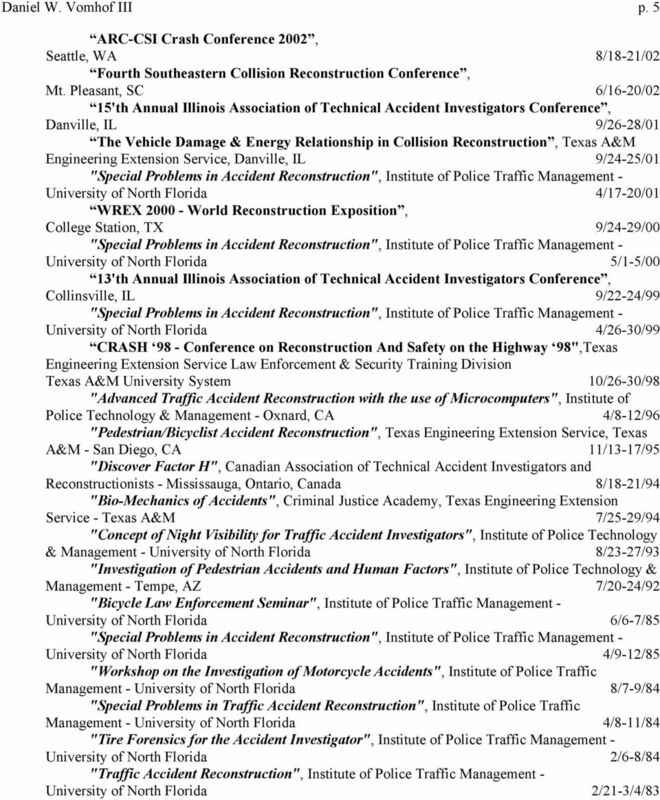 Reconstruction of vehicle, pedestrian, and motorcycle accidents! Evaluation of Pedestrian/Facility/Walking Surface interactions! Measurement and evaluation of lighting as it affects perception of hazards! Measurement and evaluation of sound levels! Documentation of vehicle evidence and scene conditions through photography and measurements! Preparation of scale scene diagrams and other exhibits for use in depositions, arbitration hearings, and trial. Additional responsibilities have included:! Reanalysis of blood and urine samples for alcohol, typing of the blood samples, and review of DUI arrest reports for determination of driving behavior. 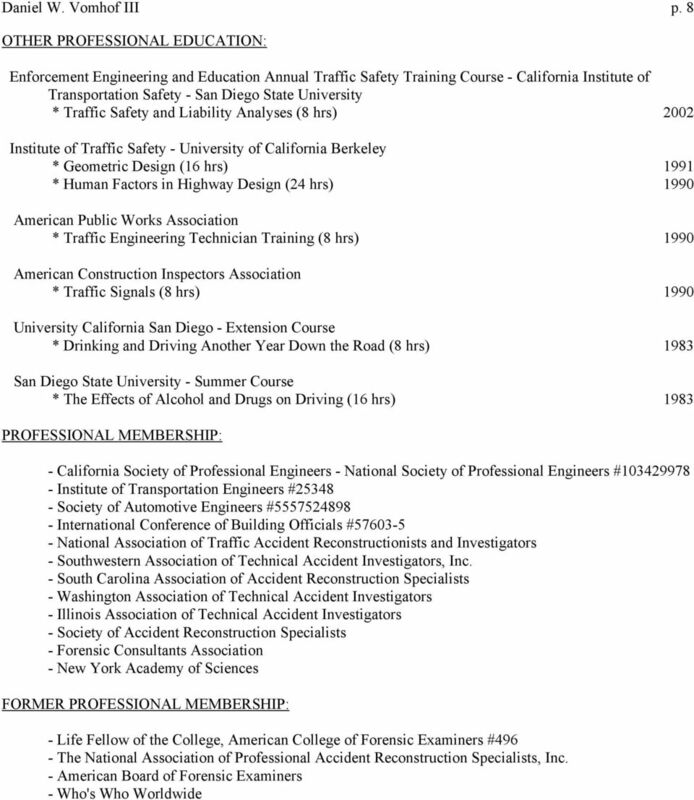 4N6XPRT Systems (1992-present) - General Manager/Technical Support/Programmer Primary responsibilities include:! Maintain data and Software Programs available for sale! Provide Technical Support to program owners! 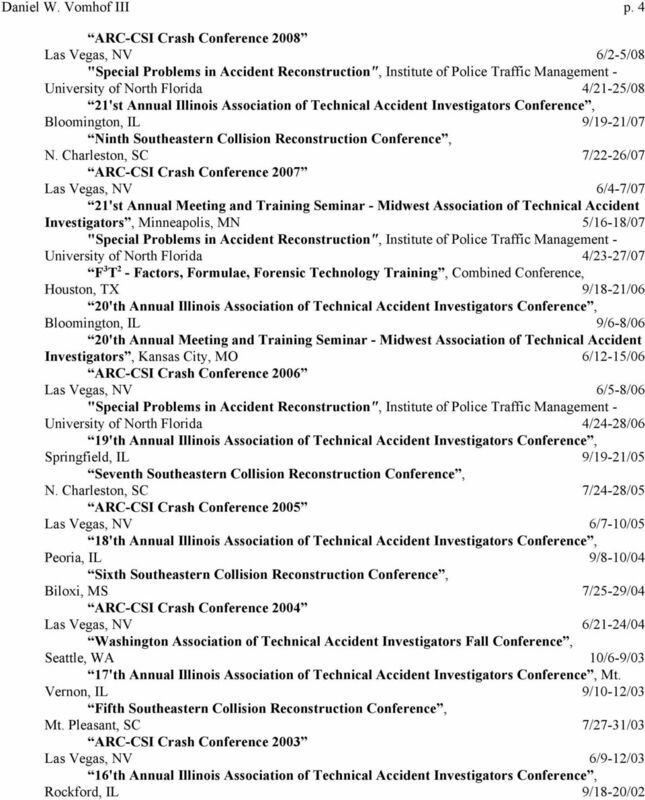 Provide data to Accident Investigators throughout North America when requested via phone or fax! Assist in the guidance towards development of new programs! Provide out of office marketing Coleman College - General Education ( ) - Adjunct Faculty. Provide instruction in College Algebra and Statistics at the undergraduate level. 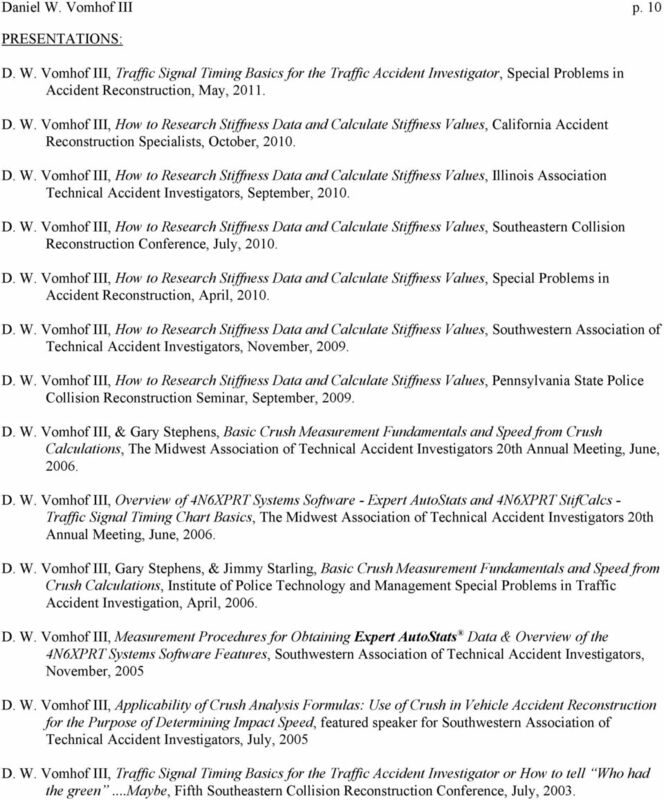 10 Daniel W. Vomhof III p. 10 PRESENTATIONS: D. W. Vomhof III, Traffic Signal Timing Basics for the Traffic Accident Investigator, Special Problems in Accident Reconstruction, May, D. W. Vomhof III, How to Research Stiffness Data and Calculate Stiffness Values, California Accident Reconstruction Specialists, October, D. W. Vomhof III, How to Research Stiffness Data and Calculate Stiffness Values, Illinois Association Technical Accident Investigators, September, D. W. Vomhof III, How to Research Stiffness Data and Calculate Stiffness Values, Southeastern Collision Reconstruction Conference, July, D. W. Vomhof III, How to Research Stiffness Data and Calculate Stiffness Values, Special Problems in Accident Reconstruction, April, D. W. Vomhof III, How to Research Stiffness Data and Calculate Stiffness Values, Southwestern Association of Technical Accident Investigators, November, D. W. Vomhof III, How to Research Stiffness Data and Calculate Stiffness Values, Pennsylvania State Police Collision Reconstruction Seminar, September, D. W. Vomhof III, & Gary Stephens, Basic Crush Measurement Fundamentals and Speed from Crush Calculations, The Midwest Association of Technical Accident Investigators 20th Annual Meeting, June, D. W. Vomhof III, Overview of 4N6XPRT Systems Software - Expert AutoStats and 4N6XPRT StifCalcs - Traffic Signal Timing Chart Basics, The Midwest Association of Technical Accident Investigators 20th Annual Meeting, June, D. W. Vomhof III, Gary Stephens, & Jimmy Starling, Basic Crush Measurement Fundamentals and Speed from Crush Calculations, Institute of Police Technology and Management Special Problems in Traffic Accident Investigation, April, D. W. Vomhof III, Measurement Procedures for Obtaining Expert AutoStats Data & Overview of the 4N6XPRT Systems Software Features, Southwestern Association of Technical Accident Investigators, November, 2005 D. W. Vomhof III, Applicability of Crush Analysis Formulas: Use of Crush in Vehicle Accident Reconstruction for the Purpose of Determining Impact Speed, featured speaker for Southwestern Association of Technical Accident Investigators, July, 2005 D. W. Vomhof III, Traffic Signal Timing Basics for the Traffic Accident Investigator or How to tell Who had the green...maybe, Fifth Southeastern Collision Reconstruction Conference, July, 2003. 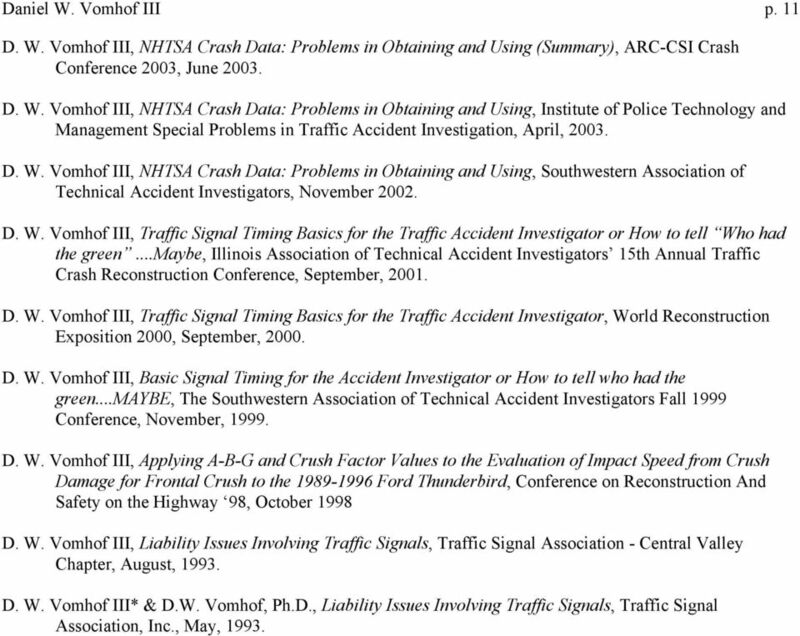 11 Daniel W. Vomhof III p. 11 D. W. Vomhof III, NHTSA Crash Data: Problems in Obtaining and Using (Summary), ARC-CSI Crash Conference 2003, June D. W. Vomhof III, NHTSA Crash Data: Problems in Obtaining and Using, Institute of Police Technology and Management Special Problems in Traffic Accident Investigation, April, D. W. Vomhof III, NHTSA Crash Data: Problems in Obtaining and Using, Southwestern Association of Technical Accident Investigators, November D. W. Vomhof III, Traffic Signal Timing Basics for the Traffic Accident Investigator or How to tell Who had the green...maybe, Illinois Association of Technical Accident Investigators 15th Annual Traffic Crash Reconstruction Conference, September, D. W. Vomhof III, Traffic Signal Timing Basics for the Traffic Accident Investigator, World Reconstruction Exposition 2000, September, D. W. Vomhof III, Basic Signal Timing for the Accident Investigator or How to tell who had the green...maybe, The Southwestern Association of Technical Accident Investigators Fall 1999 Conference, November, D. W. Vomhof III, Applying A-B-G and Crush Factor Values to the Evaluation of Impact Speed from Crush Damage for Frontal Crush to the Ford Thunderbird, Conference on Reconstruction And Safety on the Highway 98, October 1998 D. W. Vomhof III, Liability Issues Involving Traffic Signals, Traffic Signal Association - Central Valley Chapter, August, D. W. Vomhof III* & D.W. Vomhof, Ph.D., Liability Issues Involving Traffic Signals, Traffic Signal Association, Inc., May, 1993. 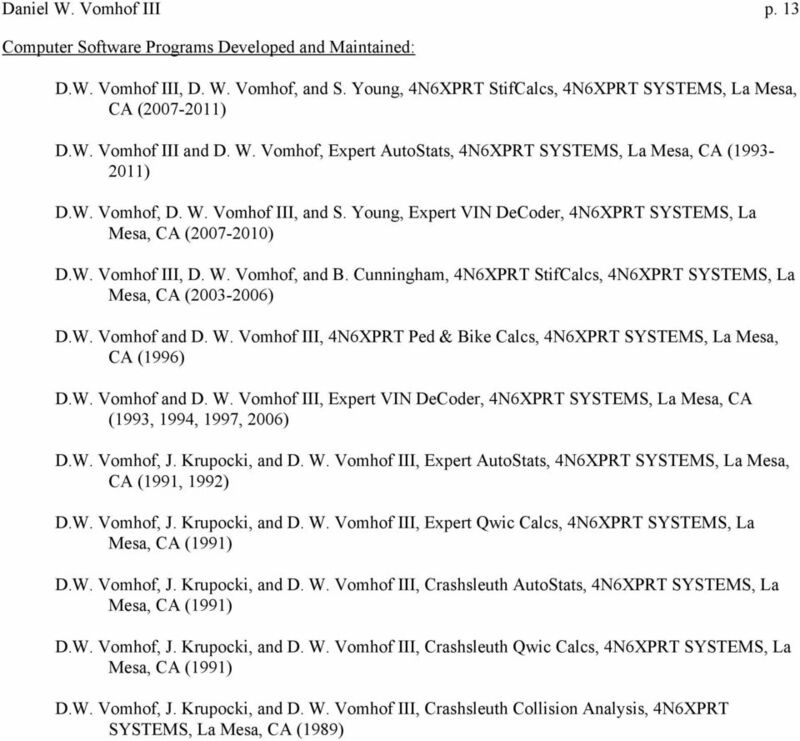 12 Daniel W. Vomhof III p. 12 PUBLICATIONS: A. S. Rich, J. N. Cofone, M. L. Schramm, D. W. Vomhof III, 2008 Joint Conference Lateral Pole Crash Tests Results, MOMENTUM Volume 16 Issue 1 (April 2009.) D. W. Vomhof III, Braking Effectiveness Lessens at Higher Speeds" Is Still True Today? ?, First Contact Vol 12 Issue 1 (2008). 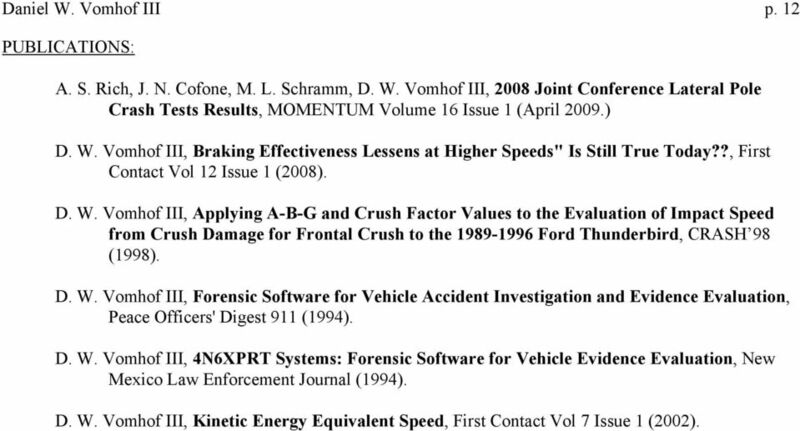 D. W. Vomhof III, Applying A-B-G and Crush Factor Values to the Evaluation of Impact Speed from Crush Damage for Frontal Crush to the Ford Thunderbird, CRASH 98 (1998). D. W. Vomhof III, Forensic Software for Vehicle Accident Investigation and Evidence Evaluation, Peace Officers' Digest 911 (1994). D. W. Vomhof III, 4N6XPRT Systems: Forensic Software for Vehicle Evidence Evaluation, New Mexico Law Enforcement Journal (1994). D. W. Vomhof III, Kinetic Energy Equivalent Speed, First Contact Vol 7 Issue 1 (2002). Accident Reconstruction in the Southeast. John Andrew Hansen Department of Criminology and Criminal Justice University of South Carolina Columbia, SC 29208 hansenja@email.sc.